There are times when impromptu things turn out better than the planned ones! This weekend happened exactly the same. I had guests coming to my house and wanted to make a special dessert for them. I didn’t put much thought to it, all I knew I wanted to make use of the shot glasses lying in my kitchen closet. Something small, handy and delectable! 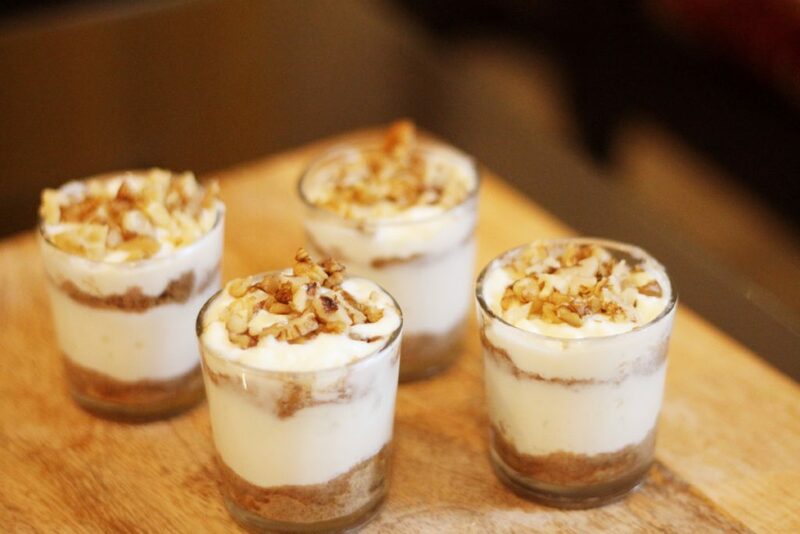 So I used my little food experience to create a yogurt and biscuit crumb mini dessert and it turned out amazing! Since it was prepared during the evening the pictures are taken during the evening time. So without much talking, let us get going! Take Ragi biscuits and grind them into a fine powder. Now take shot glasses and add biscuit crumb, pressing down. Prepare 6 glasses and keep them in the refrigerator. For Yogurt: Preheat the microwave oven at 120-degree Celsius. Meanwhile, in a microwave-safe glass bowl add curd and beat well to make it smooth. Add condensed milk and fresh cream and beat to make the mixture smooth. Once the oven preheats, put the yogurt bowl in the oven and let it bake for 40 minutes. After it is baked and set, take it out and let it cool. 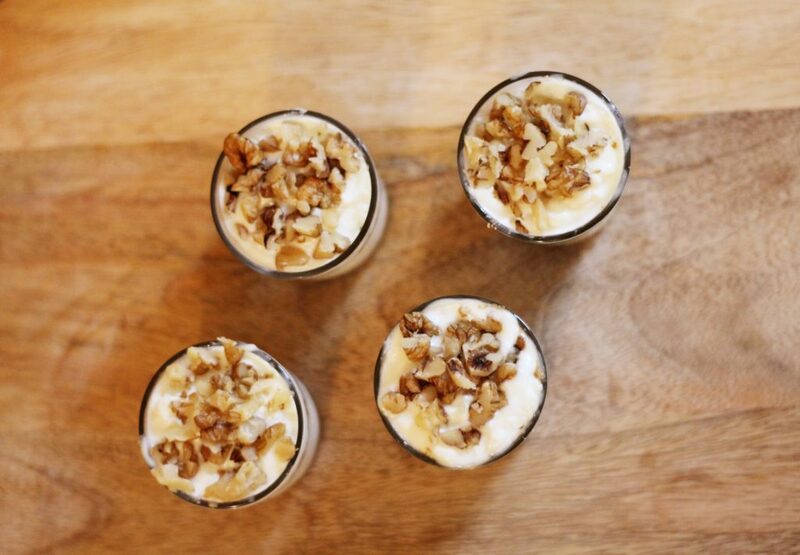 Take out the shot glasses and layer with yogurt, add another layer of the biscuit crumb and then yogurt. 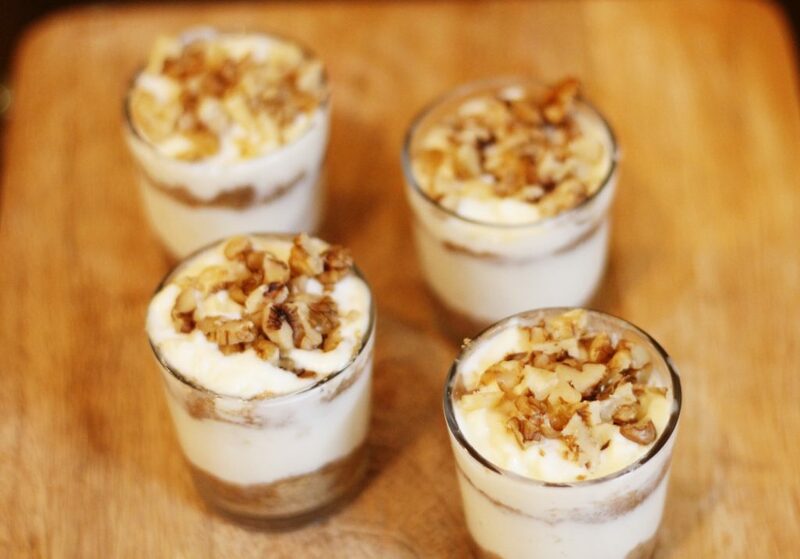 Top it off with walnuts and keep in the refrigerator till you serve the dessert. 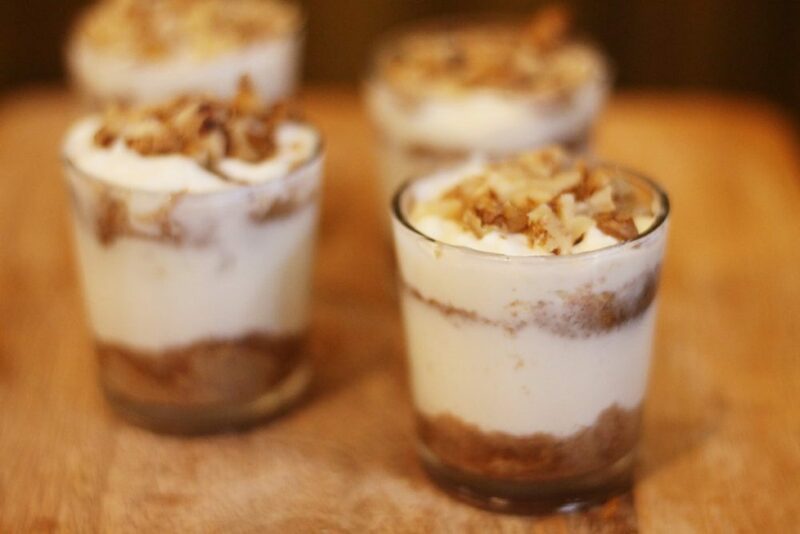 Make this compact and yummy dessert for your guests and garner compliments, as I did! Know that: You can also use other dry fruits like almonds, cashew nuts or raisins. You can add chopped fruits like mango or pineapple to the yogurt to make it more colorful!